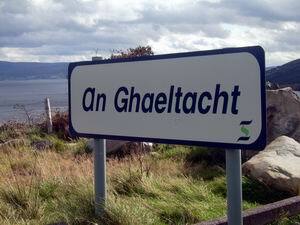 Gaelic can still be heard in Ballinskelligs as a natural tongue, albeit in a very restricted usage. In the latter part of the 20th century the majority of the people of Ballinskelligs spoke only in Irish. Up to the beginning of the 19th Century, Irish was spoken by all classes in South Kerry, even by landowners who were catholic such as the O’Connells, who spoke English with the Protestant landlords and Irish with their tenants and servants. Seán O Conaill the famous Irish story teller from Cill Rialaig, Ballinskelligs. In his introduction to his book talks about people’s attitude to the Irish language, wishing he had been born a generation later. Seán O Conaill was born in 1853 in the village of Cill Rialaig, Ballinskelligs. “There was not a word of English here in the old world that was in it then. My father had not a word of it nor had his three brothers and his five sisters nor anyone else for that matter. They managed to get along and do their Business with Irish. The people who are now forty years of age have a little English, but when I was young there was no school near me, and that has left me without English. If I had got a chance to go to school when I was young, I would not be here now. There was no respect for Irish and when I used to go to the market in Cahirsiveen. I would not sell my cow or my horse without help from a man with English, and that was heartbreaking. People used to laugh at us for not having the English, but now there is a change in the world, thanks be to God! Comhchoiste Ghaeltacht Uíbh Ráthaigh is a community group established in 1998 to act as an umbrella for the development groups in the 5 Gaeltacht areas on the western end of the Iveragh Peninsula. The Comhchoiste is involved in many things including promoting the Irish language, developing community projects which are of benefit to the community and delivering essential services within the community including rural transport. Further details about the work of the Comhchoiste is available on our website www.uibhrathach.ie . Is scáth ghrúpa dos na coistí forbartha pobail sa Ghaeltacht áitiúil a bunaíodh i 1998 é Comhchoiste Ghaeltacht Uíbh Ráthaigh. Tá clár oibre leathan á láimhseáil ag an eagraíocht, ina measc cur chun cinn na Gaeilge, forbairt pobail ar leas an cheantair ina iomláine agus soláthar seirbhísí riachtanacha sa phobal, seirbhís iompair tuaithe ina measc. Tá breis eolais i dtaobh obair an Chomhchoiste ar fáil ar www.uibhrathach.ie .